New book, 328 pages. This is a handbook of cancer care from the technician perspective. Providing information on cancer from cause to treatment, this comprehensive resource focuses on the nursing role, emphasizing technical procedures, staging, and patient support. By equipping nurses with the information they need to properly and safely perform cancer treatments, "Oncology for Veterinary Technicians and Nurses" promotes working as part of a team to provide optimal care for dogs and cats with cancer. With chapters ranging from treatment strategies and owner support to emergencies and clinical cases for specific diseases, the book is a comprehensive guide to nursing the veterinary cancer patient. An appendix also provides quick reference to conversion charts, as well as information on supplementation and dosing, to allow fast access to key information. 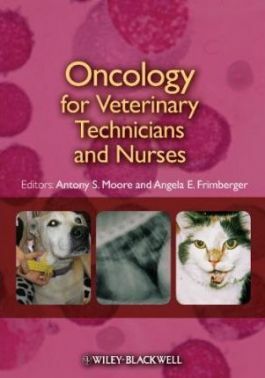 "Oncology for Veterinary Technicians and Nurses" is an important resource for the growing number of technicians seeing cancer patients, as well as for specialty oncology technicians and technician students. Key features: Comprehensive guide to cancer care aimed at the veterinary technician or nurse; Emphasizes the technician's role throughout, including technical procedures, staging, and patient support; Promotes working as a team to provide optimal cancer care; Covers topics ranging from treatment strategies to owner support and emergency care, with clinical cases for specific diseases; Includes appendices for quick reference to essential charts and dosing information.